Enter the Acoustic Expo 2013 competition! First introduced in 1936, the J-35 was Gibson's answer to a call for quality, hand-made construction and inspired tone at a simple price. The 2013 J-35 is the modern version of that first magical round-shoulder. This fabulous guitar features forward shifted advanced bracing, like the Advanced Jumbo, which gives the J-35 a more powerful and even voice. To be in with a chance of winning this guitar, simply enter your details over on the competition page. The competition is open to USA and UK residents. 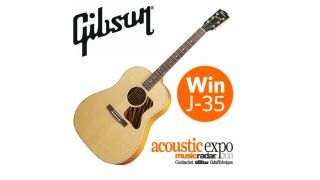 The winner will be announced at the end of Acoustic Expo, a free online show coming to MusicRadar on the 18th and 19th September 2013.